Good360 is a way for businesses to donate brand new unsold goods to charities and Not for Profits. The Good360 online platform provides a one-stop shop for accessing non-perishable goods donated from some of Australia’s biggest brands, retailers and manufacturers including Moose Toys, L’Oreal, Woolworths, 3M, Linen House & LUSH. With the aim of getting brand-new, non-perishable goods into the hands of Australians in need this festive season, Good360 has created the –Goodie Bag‘. 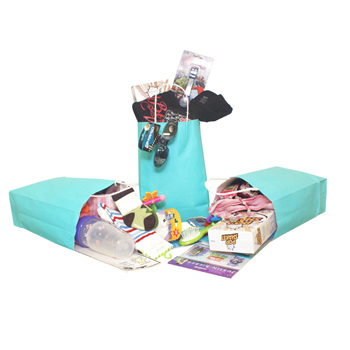 The Goodie Bags have been tailored with high quality goods for babies, girls & boys, teens (male & female) and adults (male & female), meaning a special present for those with very little. The Goodie Bags are purchased online for $25 each and donated to Australians in need. The purchaser receives a certificate from Good360, which makes a great kris-kringle gift or gift for someone ‘who has everything”. If a child purchases the Goodie Bag, for an Australian child in need, the certificate comes as a colouring-in stencil. 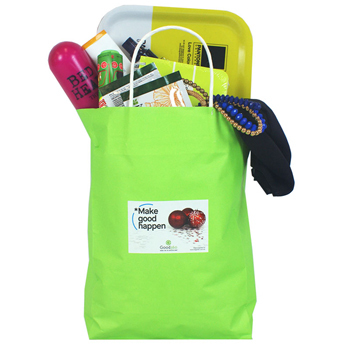 The Goodie bags are a great way to give back this Christmas! Watch this video to find out more. Alison Covington is an innovator, passionate about creating change that disrupts industries, empowers communities and creates a better world. As a Director of multi-million public transport business, Alison developed a record for innovation and raising standards, increasing profitability in loss-making companies and guiding them through the obstacles of major industry reform. Her successful business prowess has become a platform for her philanthropic ideas – today, she uses her corporate expertise to benefit others and make a positive social difference. Working with international businesses in Europe, UK and Northern America, Alison has a demonstrated ability to foster, cultivate and strengthen organisational, community and political ties. Alison’s success in business has now become a platform for her philanthropic ideals. She uses her considerable corporate expertise to make a positive social difference through values-driven organisations such as Good360, which launched in Australia in 2013. Question: Questions What inspired the launch of Good360 Australia? Alison Covington: I read about the United States’ instance of Good360, which has been operating for over 30 years, connecting 40,000 charities with 4 billion dollars worth of brand new, non-perishable goods. I did some research and couldn’t see the same concept being utilised in Australia so I decided to be the person that made it happen here (Australia). Alison Covington: Good360 is a way to connect businesses’ brand new goods to charities and Australians in need. Good360 is an online platform, similar to eBay, which allows charities to order brand new goods they need for their cause or communities. We have strong relationships with major product partners from some of Australia’s largest manufacturers and retailers, who donate their goods. Good360 provides a distribution solution for them, while helping the environment and giving back to the community. Question: What is involved during a day at Good360/ Can you share with us a typical day, for you? Alison Covington: A day starts at 6am, I get my family sorted and out the door by 7am, then I’m on my way to work. No office day is ever the same, some days I am meeting with board members and speaking at conferences, and others I am helping in the warehouse or chatting to charities. It’s ever changing but I enjoy the diversity and the challenge. By 7.30 – 8PM, I am back home with my two children for an hour or so, I talk to them about their days, then I work for a few more hours before bed, a few hours sleep then I’m back up at 6am again. Question: Can you tell us about your Goodie Bags? Alison Covington: The Goodie Bags, that’s a campaign we have just launched as we saw the need to give charities the gifts and goods they wanted and needed for Christmas. We have worked very hard with our product partners such as LUSH, 3M, L’Oreal and Woolworths to put together 5,000 bags of treats for all ages and genders. In any Aussie neighbourhood there is someone in need and it is something I am very passionate about, for this reason the public can also donate https://www.mycause.com.au/events/christmas the cost of gifting one of our Goodie Bags to someone in need for just $25 over the Christmas period. Question: How can Australians support Good360? However, equally as important, Aussies can support us by spreading the word. We support charities of all sizes and denominations, so getting the word out is super important. Question: What’s next, for you? Alison Covington: It has been a big growth year for us here at Good360; we have gone from start-up to scale up. The last two weeks, since we launched our Christmas campaign to our charities, we have done the equivalent of a whole year’s worth of sales in two weeks – so once we get through the crazy Christmas period, we will be focusing on strategy for 2017. This includes looking at the way businesses currently donate product and creating behaviour change. We can see that there is a real need for Good360 here in Australia.